This level has medium difficulty. 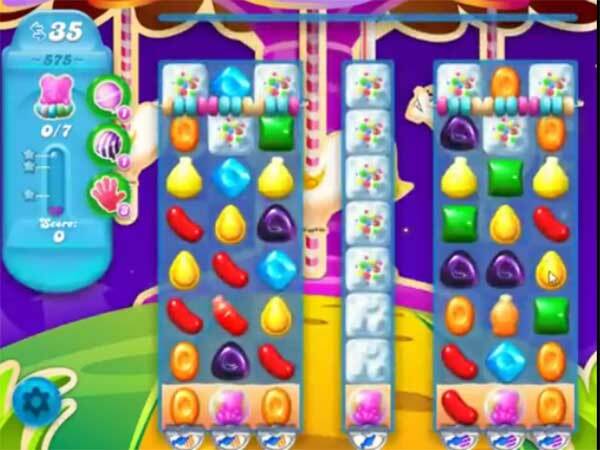 For this level try to play from the bottom of the board and make striped candy as you get the chance. Combine striped candy with other special candy to break the blockers that are in middle part of the board and move bear to the top. Please update level 575 bc there is no possible way to win this level especially with only 35 moves. First of all the hardiest part is the first bottom part. Trying to get past this part is the hardest of the whole stage bc it’s so hard just to get the 2 bears are the hardest to get above the bottom lines bc the fish ALWAYS only attack the black blocks instead of clearing the way for the bears to get through. It’s horrible just to get the 2 bottom bears above the line. Please fix this or at least add more moves like 50 or 60 bc that’s how many it’s going to take in order to get past this stage. This is a hard level, not medium. How come the video shows it a hard level but not on my computer? Please update! Absolutely agree with everything that’s been said – this level is impossible! This level is impossible and as said above there are not enough moves and the fish take out all the wrong black blocks. Update as im going to quit as iv had over 70 goes at this level and its hard not medium difficulty. This level is not only too hard, with too few moves, but really boring! You have no control over the moves, just have to go where you can. So fed up of it. Its impossible! I really don’t like this level at all. Once I got 6 bears, but then of course I ran out of lives. Why do you make it so hard? Should be get more moves than 35 to complete this level.